It’s now September and August flew by without a menu posting. 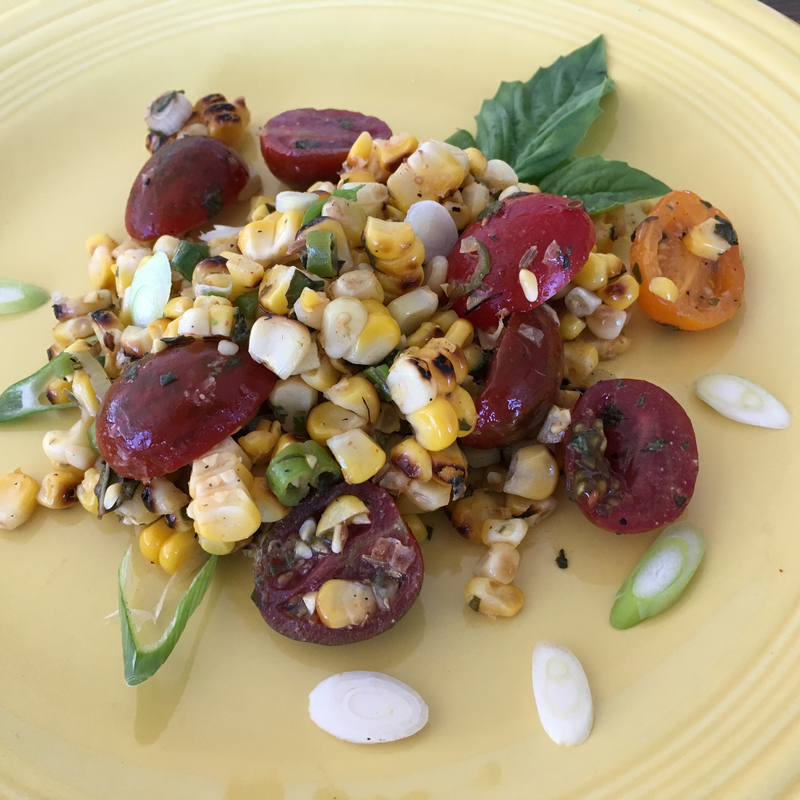 Instead, I offer some of my favourite August recipes that can still make use of the freshest produce available now: corn, tomatoes and raspberries. Recipe from Entertaining: Inspired Menus for Cooking with Family and Friends by Williams-Sonoma and adapted by Julie and Diane. Prepare a charcoal or gas grill for direct grilling over medium high heat. You can use a stovetop grill pan or even just boil the corn if no BBQ is available. Brush the corn with a bit of the olive oil and grill, turning the ears frequently, until they are lightly charred on all sides. This will take 10 to 15 minutes. Cut each ear of corn in half. Place cut side down on a cutting board and, using a sharp knife, cut down along the cob to slice off the kernels. Place all of the kernels in a large bowl and add the tomatoes, green onions, basil and feta. Add the vinaigrette and toss to coat evenly. Taste for salt and pepper. Adapted from Smitten Kitchen, with the addition of my recipe for homemade pita bread. 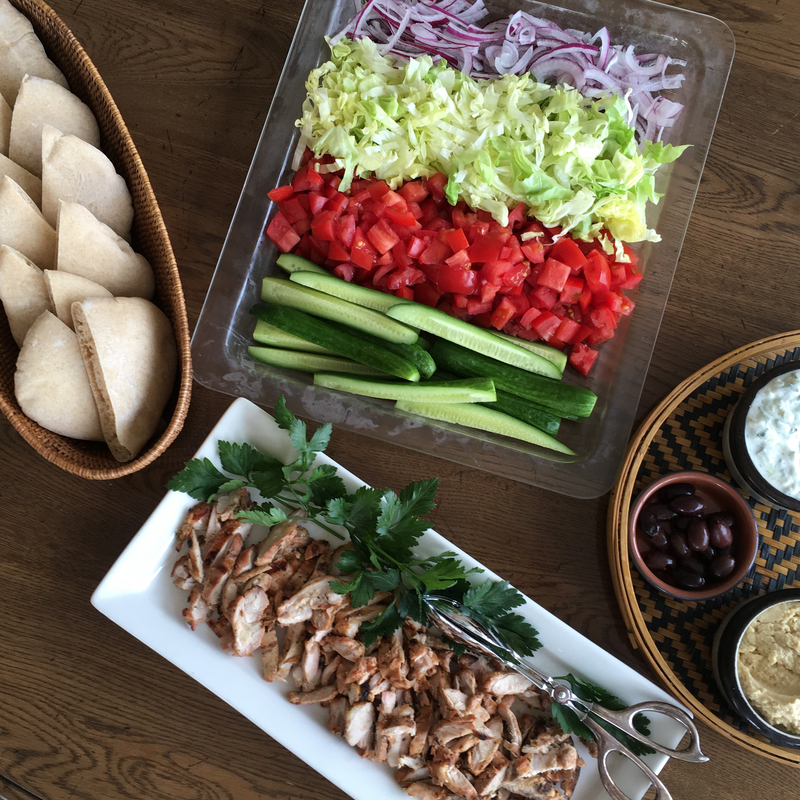 Of course, you can buy the pita, but you will be surprised how easy they are to make and how much softer and flavourful they are. For the chicken: Combine all ingredients in a large freezer bag, massaging the bag to make sure the chicken is coated in the marinade. Refrigerate for 20 minutes or up to 24 hours. For the tzatziki: Coarsely grate the cucumber directly into a sieve, sprinkle with one teaspoon salt and let drain for about 20 minutes. Squeeze out as much liquid as possible and then add it to the yogurt in a medium sized bowl. Add the lemon juice, vinegar, dill, garlic, salt and pepper and stir to combine. Taste and adjust seasonings. Chill until ready to serve. Prepare salad: Arrange lettuce, onion, tomatoes and cucumbers on a platter. To tame the pungency of the onion, you can slice it and soak it in cold water for about 30 minutes, then drain it. Cook chicken: Heat the barbecue or a grill pan to medium-high. Remove chicken from marinade and grill on first side until dark lines appear, about 5 minutes, then flip and grill for 3 minutes more on the other side. Cooking times will depend on how thick the chicken pieces are. Transfer cooked chicken to a cutting board, let rest for a couple of minutes, then slice into strips. Cut pitas in half or into wedges. Serve with the platter of gyro ingredients and everyone helps themselves. You can also add dishes of hummus and olives. Mix water, oil, salt, sugar and yeast in a bowl (food processor works, or mixer with dough hook). Add flour one cup at a time, kneading or mixing until you have a smooth dough. 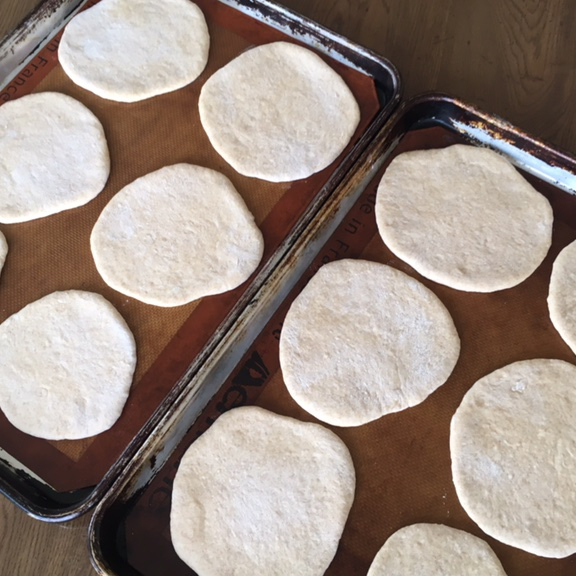 Divide into 12 pieces, roll into 5″ rounds, and let rise on floured baking sheets for ½ an hour per side. While dough is on second rise, heat oven to 500ºF. Bake pitas for 3 minutes, then turn and cook for 2 more minutes. Remove from the oven and cover with a clean cloth so that they stay soft until ready to serve. You can serve them like this or brush them lightly with olive oil and grill them quickly, just until they have grill marks. They freeze well. Makes 1 dozen, or 16 smaller pitas. Recipe is on this site here. 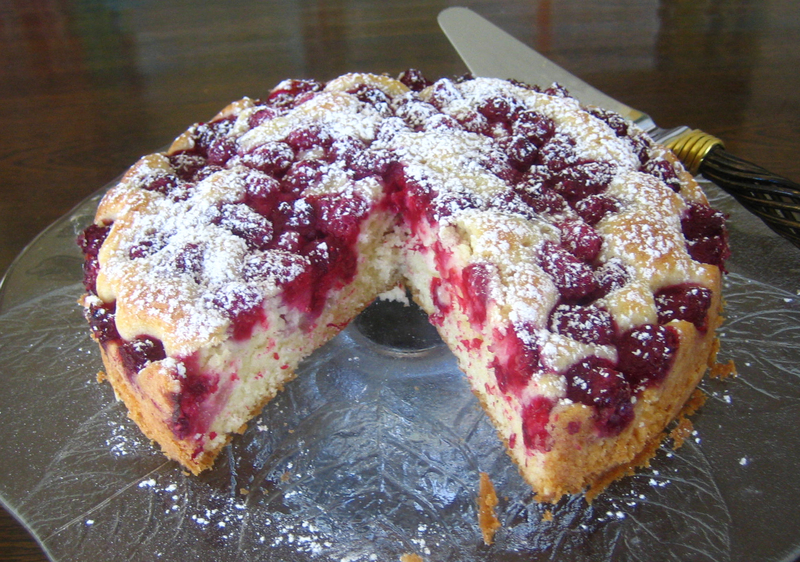 It is a quick cake to put together and you can substitute the raspberries with other fruit: plums, apricots or strawberries.